I've titled this post 'the Guinness episode' because I think I would have needed several pints of it after drawing the challenging sitters on this weeks Sky Arts Portrait competition episode. I thought that actress Pauline McLynn was particularly brave to take on a classical pose: reclining semi naked in front of the mirror. Pauline is more well known for her portrayal of house keeper, Mrs. Doyle, in the classic situation comedy Father Ted (Channel 4). Pauline apparently researched her pose for some time, and I think she did a fantastic job. Her pose reminds us of paintings such as the Rokeby Venus by Velazquez - currently held in the National Gallery, London. Moone Boy star David Rawle,demonstrated great maturity by his ability to sit still for such long periods of time, and Rap Artist Lethal Bizzle took up a commanding pose for his painters. However, I choose to write again about the power of the gaze as I did in the Glagow post from my own experience. 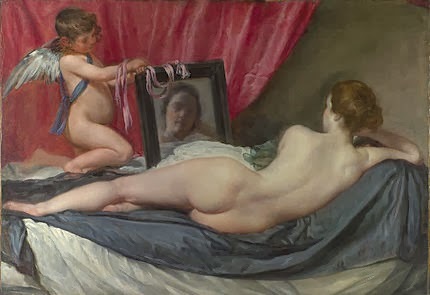 Pauline, by laying in front of her large mirror, actually reflected the gaze back at the artists working on the pose - creating yet further implications of watching and being watched. This process, I feel, was actually too much for one artist, whose lively impasto brush strokes of Pauline appeared to reflect back the piercing gaze of not only the sitter, but of all the other artists, the camera, the judges, the interviewers, the audience and himself. The pressures of scrutiny compounded by time, expectation and performance were quite a cruel experience for some. Nonetheless, the standards under such pressure were again, amazing. The sheer variety of talent was revealed through the developing narrative of the show.The format from episode to episode is well established and makes for easy viewing, so now the viewer can focus on observing the progression of work. I think everyone is doing a fantastic job on the show - and I am inspired and in awe of some of the sitters and artists alike.